We’d love your help. Let us know what’s wrong with this preview of The Color of Wealth by Barbara J. Robles. For every dollar owned by the average white family in the United States, the average family of color has less than a dime. Why do people of color have so little wealth? 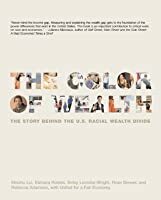 The Color of Wealth lays bare a dirty secret: for centuries, people of color have been barred by laws and by discrimination from participating in government wealth-building programs that benefit white Ameri For every dollar owned by the average white family in the United States, the average family of color has less than a dime. Why do people of color have so little wealth? The Color of Wealth lays bare a dirty secret: for centuries, people of color have been barred by laws and by discrimination from participating in government wealth-building programs that benefit white Americans. Written by five leading experts on the racial wealth divide who recount the asset-building histories of Native Americans, Latinos, African Americans, Asian Americans, and European Americans, this book is a uniquely comprehensive multicultural history of American wealth. With its focus on public policies—how, for example, many post–World War II GI Bill programs helped whites only—The Color of Wealth is the first book to demonstrate the decisive influence of government on Americans’ net worth. To ask other readers questions about The Color of Wealth, please sign up. A comprehensive look at the historic political and socio-economic reasons why there is a large wealth disparity between white and non-white groups in America. A must read for anyone interested in the issue of economic inequality. Shannon Gibney writes on "The Color of Wealth" by Rose Brewer, who teaches at the University of Minnesota. Brewer, who writes and teaches in the African American and African Studies Department on the Twin Cities campus, said that uncovering and exploring this issue was the major catalyst for creating The Color of Wealth: The Story Behind the U.S. Racial Wealth Divide, a comprehensive volume which The New Press brought out last year. “We had been talking about this book for quite some time, and once we decided that we would do it, it took around five years to assemble,” said Brewer. 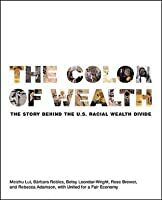 The Color of Wealth’s authors hail from disparate parts of the country, and also have disparate racial and ethnic backgrounds, but they share a commitment to creating and sustaining an economically just society. Meizhu Liu is executive director of United for a Fair Economy, a Boston-based organization that works for economic parity in all communities; Barbara Robles is an expert in Latino public policy and is currently at work on her book Rich Latino/Poor Latino: Wealth Inequality, Cultural Capital and Social Policy; Betsey Leondar-Wright is UFE’s communications director and a long-time economic justice organizer and researcher; and Rebecca Adamson is founder and president of First Nations Development Institute (1980) and founder of First Peoples Worldwide (1997). All five authors, including Brewer, are active members of UFE, which played a leading role in the book’s development. Check out The Color of Wealth at your local library or bookstore. 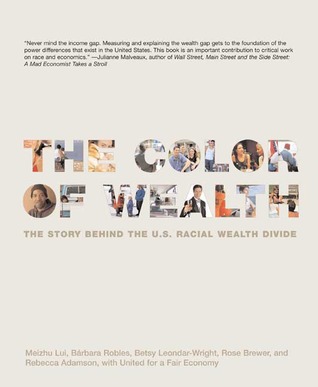 "The Color of Wealth": A bevy of economists demonstrate in massive detail the racial origins of wealth inequality and the myriad ways government policy has contributed to the racial wealth gap. Super important work if a tad dry in places. Not a fan of the author's style. Although I agree with the analysis, the writing was extremely dense and biased. However, it is important to know this information. Pulls back the cover on the history of structural (and individual) white supremacy in our country. A must read for anyone wanting a clear-eyed look at what must be done for the sakes of all of us. Found this look into the historical roots of inequity to be quite fascinating. I appreciated the layout by race then with a concluding chapter focusing on white privilege followed by a chapter with possible solutions. A fascinating book... places a priority on FACTS, and explodes a lot of pre-conceived notions regarding wealth and its distribution (current and past) in the United States. Strong economic survey of economic racial divide and its relevance today. I heard a recording of a speech the author gave on NPR, and can't wait to get ahold of this book.